507.45 Blue Chambray Work Shirt, Short Sleeve - Blue Chambray - Bohlings - KEY, KEY Brand Work Shirt, Short Sleeve, 507.45, KEY Shirts, Pre-Washed, Roomy, ease of movement, KEY Chambray from KEY Industries, Inc. The good looks and comfort of 100% Cotton KEY Chambray Shirt with Short Sleeves makes the hot weather a bit easier to work in. The KEY Blue Chambray Shirt is the perfect Short Sleeve shirt for a variety of industry or construction jobs. The Short Sleeves keep you cool, and the Long Tails assure you that your Shirt will Stay Tucked In! These KEY shirts are made from the Highest Quality Materials and are Made to Last. 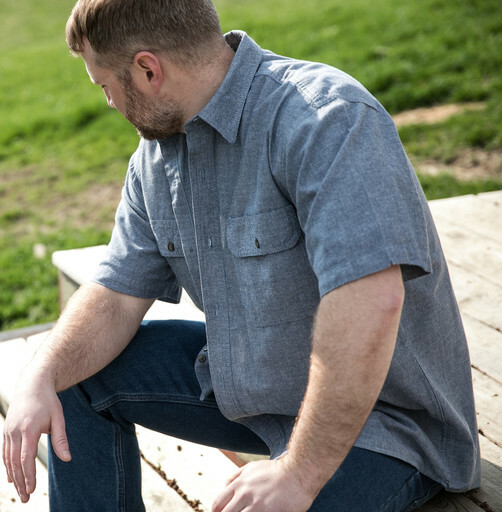 Not only is the KEY Pre-washed Short Sleeve Chambray Work Shirt Durable, it is Comfortable too! Conveniently Wrinkle Resistant and Ready for Work as soon as you slip it on. This KEY Light Weight Denim Shirt has Stylish Button Closures for great looks. Easy to Wash but Never Needing an Iron. 100% Cotton Breathes which is great for Added Comfort on those hot days. All Cotton Fabric means this Long Sleeve shirt Breathes with you to help keep you cool.